The National Weather Service has issued a tornado watch for several North Texas counties until 10 p.m.
Brown, Burnet, Callahan, Coleman, Collin, Comanche, Concho, Cooke, Denton, Eastland, Erath, Fannin, Gillespie, Grayson, Hamilton, Hood, Jack, Kerr, Kimble, Lampasas, Llano, Mason, McCulloch, Menard, Mills, Montague, Palo Pinto, Parker, Runnels, San Saba, Shackelford, Somervell, Stephens, Taylor, Throckmorton, Wise and Young. 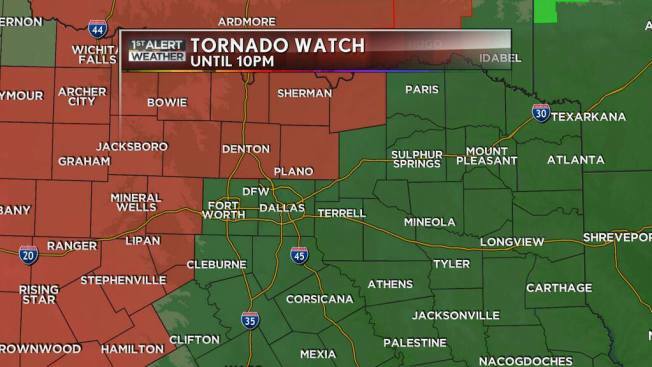 At this time, Dallas, Tarrant, Johnson, Ellis, Kaufman and Rockwall counties are not included in the tornado watch, according to the National Weather Service. A hazardous weather outlook is in place for most of North Texas, where thunderstorms are expected to form along a dry line mostly west of the Metroplex. Severe storms remain likely with large hail and damaging winds being the primary threats. Isolated tornadoes are also possible. The threat is expected to continue into Tuesday night before things quiet down ahead of the weekend.